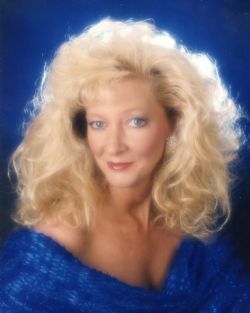 Judith ''Judi'' Darlene Rhodes, 63, of Brookland, passed away Friday, April 12, 2019. She was born April 25, 1955 in Jonesboro to Francis and Lelah Blanche (Hill) Foster. Judi loved going to flea markets, yard sales, shopping, exploring nature and working in her yard, but her main love was for her family, especially her grandbabies and the newest great grandbaby. Judi was preceded in death by her parents. Survivors include her husband of 29 years, Virgil Rhodes; son, Dusty Rhodes, of Brookland; daughters, April (Frank) West, Robin (Shannon) Whitenton, both of Bono; grandchildren, Brittany (Zach) Crisp, Raven Hutchison, Skylar McLeod, Gabriel Hosier and Michaela Whitenton all of Jonesboro; great grandchild, Milliana McLeod; brothers, Elwood (Kathy) Foster, Bill Foster, Dean Foster, Ronnie (Angie) Foster; sisters, Naomi Seat and Patricia Sharp; and many nieces and nephews. Funeral service will be Tuesday, April 16, 2019, 1:00 pm at Roller Farmers Union Funeral Home, with Steve Thornton officiating. Pallbearers will be, Todd Foster, Josh Foster, Jerry Foster, Payton Futrell, Coy McCoy and Chad McCoy. Burial will be at Pine Log Cemetery. Visitation will be Monday from 6:00 – 8:00 pm at the funeral home. Click Play below to view the Video Memorial for Judith Darlene Rhodes. If you would like to order a DVD copy of the video, please contact the funeral home at 870-932-3531.